Trips built for adventurers of all ages with age-appropriate activities and hotels that know families. Small group experience; Max 20, avg 12. Fly to Puerto Maldonado and continue by motorized canoe to the comfortable, intimate, and exclusive G Lodge Amazon. Enjoy guided excursions led by expert naturalists to spot wildlife at nearby oxbow lakes, and treetop towers. Fly from Lima to Puerto Maldonado. Enjoy visits to oxbow lakes to learn about the jungle and its inhabitants. Be introduced to the area’s rich flora and fauna by expert naturalist guides, who can teach extensive uses for medicinal and other forest plant resources through traditional techniques. Be prepared to go early morning or evening to avoid the heat of midday. Enjoy a leisurely pace – the trip requires some walking, but nothing too strenuous. Climb in and move swiftly through the water to the next stop. Free time is yours to use any way you want. Explore the cosmopolitan city of Cusco, the former capital of the Inca Empire. This vibrant city has endless streets, monuments, and markets to discover that will fire the imagination and capture the heart. Enjoy the unique experience of visiting the historic spiritual centre of the Incas, the "Lost City" of Machu Picchu. Tour the ruins and have the opportunity to soak in the nearby thermal baths. Return by train to Ollantaytambo or Poroy and then transfer by van to Cusco. Please Note - on some departures it may not be possible to visit the Cusco Youth Drop-in Centre, as it may be closed for seasonal holidays. On these occasions, this visit will be replaced with a visit the Caccaccollo and the Planeterra Women's Weaving co-op. Here your family can meet the women and learn about traditional weaving methods. Visit the Cusco Youth Drop-in Centre, a drop-in program where youth living in extreme poverty are taught important life skills and are given meals and can participate in skill-building workshops designed to help them create a better future. Your trip is just that – yours. Want to linger at the market or grab a table at that cozy café? Consider it done. We give your trip structure and direction, but you decide what you want to do with it on your free days. Hotels (6 nts), G Lodge Amazon (2 nts). G Adventures for Good: Cusco Youth Drop-in Centre Visit, Cusco. Amazon Jungle stay at the exclusive G Lodge Amazon (2 nts). Guided excursions with naturalists. Rubber boot use. Machu Picchu guided tour. Internal flights. All transport between destinations and to/from included activities. 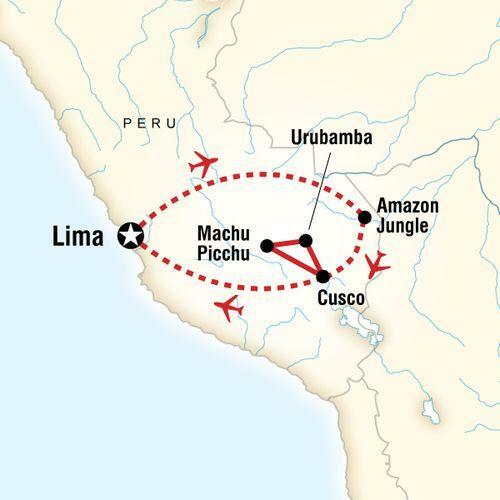 Search for wildlife along the Amazon River, explore the mysterious Inca ruins at Machu Picchu, sample the seafood in Lima. When at altitude, children are no more susceptible to Acute Mountain Sickness (AMS) than adults. However, it is harder to notice the affects of AMS in children as it can be harder for them to communicate the symptoms. Some of the symptoms of AMS are similar to those of jet-lag, or a change in food. Make sure to keep an eye on your children's behaviour while at altitude, and ensure that they continue to drink plenty of water, and take it easy for the first couple of days you are at a high altitude.